Common peony (Paeonia officinalis): growing, planting, caring. The type species, with large deep-pink or red flowers. 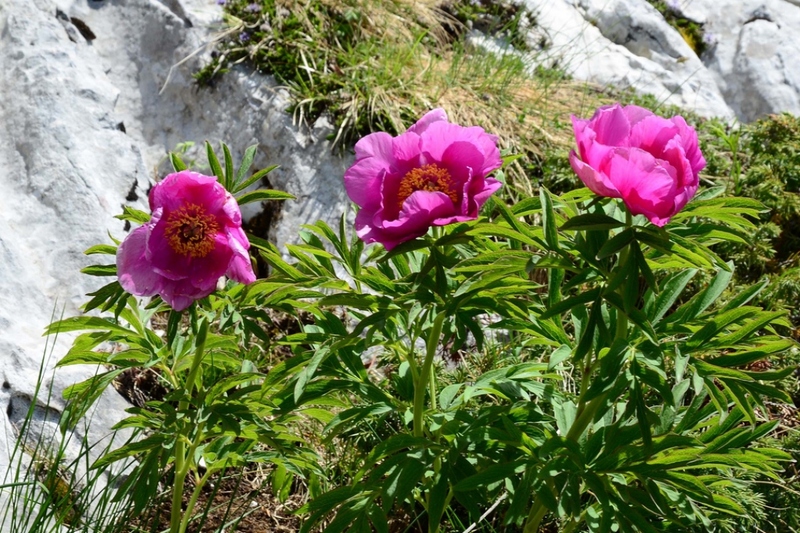 Paeonia officinalis was first used for medicinal purposes but is now grown as an ornamental. Paeonia officinalis is still found wild in Europe, but many selections are now used in horticulture, like 'Rubra Plena’, with deep crimson double flowers. Peonies are perennials, and they may be herbaceous or bushy. The leaves are either soft or dark dreen, occasionally appearing silvery. The flowers may be scented, standing, and solitary, or in the shape of a bowl or a ball. Herbaceous peonies disappear every winter and then reappear in spring. They are very easy to grow, and very rustic. Peonies carry leaves with oval or obovate folioles, that are divided either by 3 (biternate) or by 2 (pinately). Each single flower is composed of five green sepals and five to ten coloured petals. Choose to plant in autumn in order to achieve flowering in the first year. 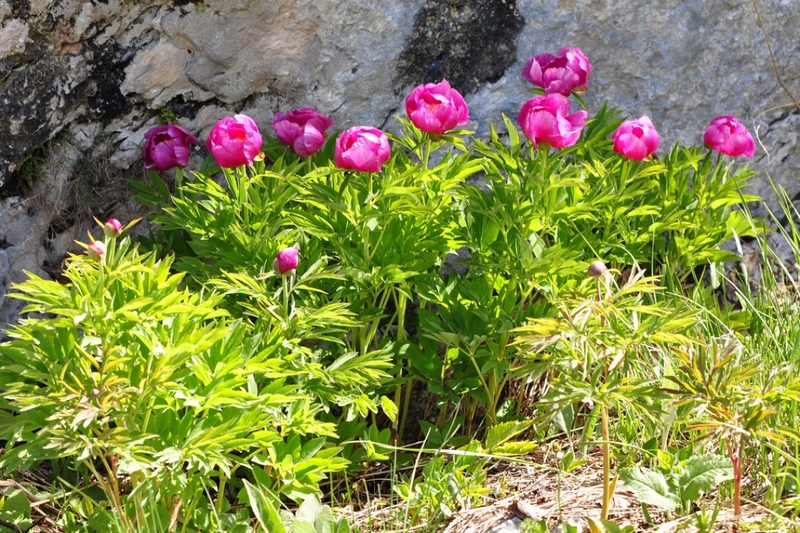 Plant peonies in sun or partial shade — ideally in a location where they will receive rays for half the day! The soil should be fertile, rich in humus, deep, cool, well-drained, and not chalky. Ideally prepare for planting a few weeks in advance, and add manure or decomposing compost — your soil will be enriched and you can remove weeds with a hoe before you plant for real! If your plants have bare roots, avoid exposing them to sun unless necessary. 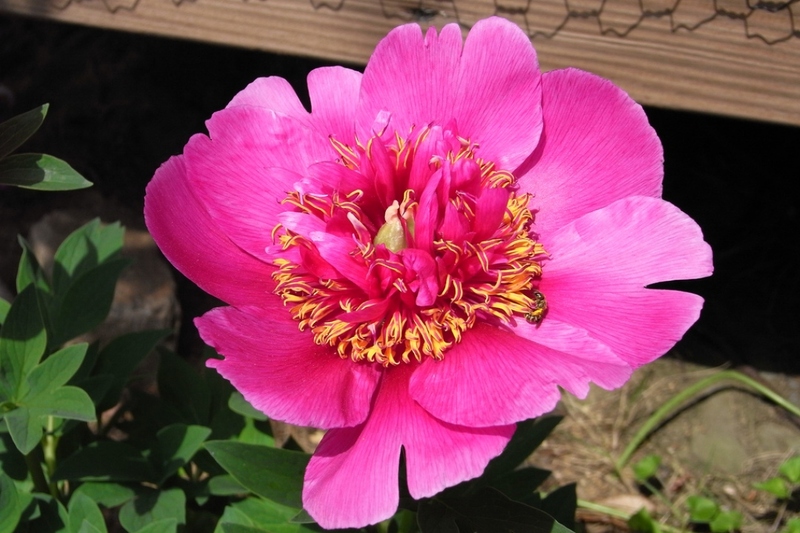 Plant in a deep hole without burying the neck, leaving 60 cm of space all around you peony. Don't sink the rhizome! 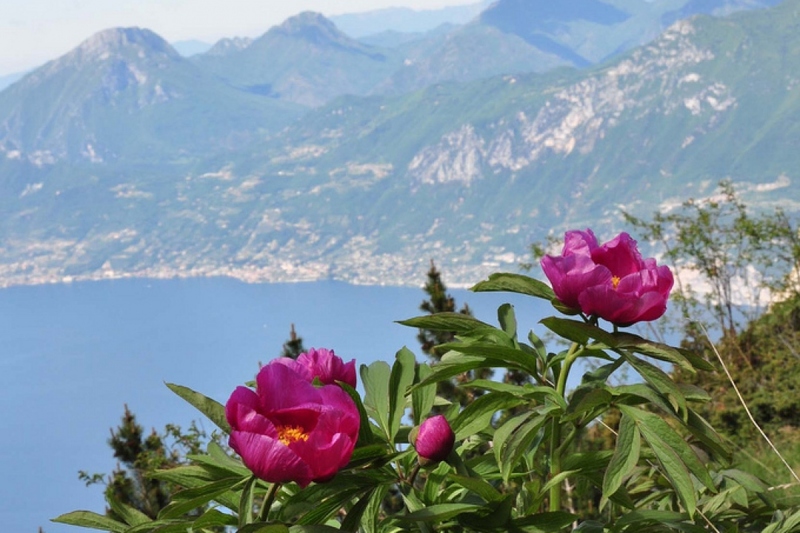 For herbaceous peony, leave about two centimeters above the buds, otherwise you run the risk of having a lot of leaves and few flowers, which would be a shame! For bushy peonies, you need to cover the stem with about five centimeters of soil to ensure that the plant branches correctly. Then form a shallow basin and water until the water no longer absorbs. Don't prune your busy peonies much, as they grow very slowly. Cut off weak and dead branches at the end of autumn and the beginning of spring. 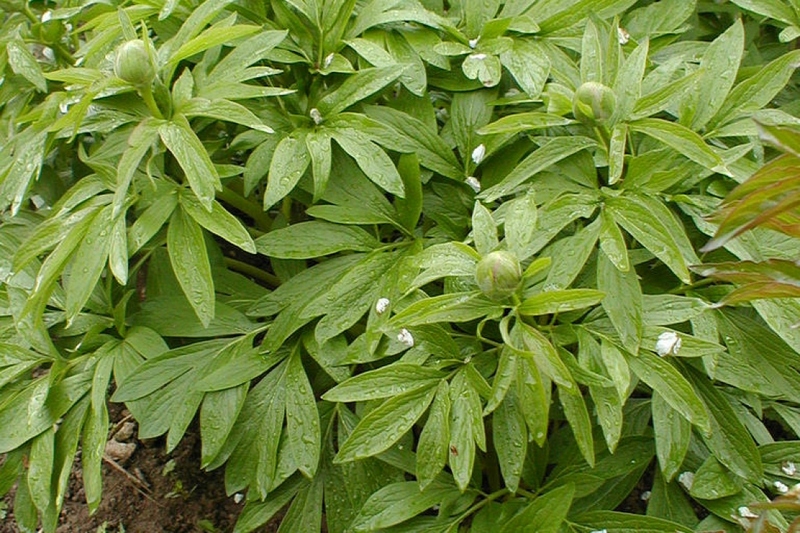 Remove dessicated foliage from your herbaceous peonies in November. Peony doesn't like to have its roots too wet, and resists a little dryness much better than overwatering! After planting your peony, carry out generous watering infrequently to encourage the root system to seek water deep underground. It's therefore suitable to water until the planting basin is full and only empties slowly. Beyond that, watering won't be necessary except in cases of prolonged drought. Mulch your peonies with an organic mulch — leaves, dry, chipped wood, maybe even grass clippings — to limit the spontaneous appearance of other flora. This will also keep the soil nice and cool while helping to create humus! Train your large-flowered peonies during flowering, by encircling them with string for example. Fertilize the base of your peonies in autumn with manure or compost — add it by lightly tilling the soil during the summer — your plant will thank you! Multiply your herbaceous peonies by division in October or March. It is possible to take a cutting from peony roots in the winter. Good to know — don't try to make a bouquet when it flowers for the first couple years, or with short, leafless stems! Peonies need all their vegetation to feed their roots at the beginning. In fact, for the first two years, your peonies might seem to stagnate terribly... But during this time, the roots do their underground work...patience! Plant it well, then forget it — time and nature will do the rest. Afterwards, you may gather the buds just before the first petal opens. As time passes, you may see brown marks begin to appear — treat these with a solution of two tablespoons sodium bicarbonate in a liter of water. In spring, ants will be all over the plant, attracted by the sugary droplets that form on the buds — let them be, they're won't damage your peonies!